All too seldom does Frances (without whom . . . ) get a mention for all the quiet and endless labours she has performed so that the OSP could operate through all these decades. Packing of parcels is a good example. I would myself admit to tearing open the packing on parcels sent to me with scant regard for whoever did the packing let alone an empathetic understanding of the labour involved. 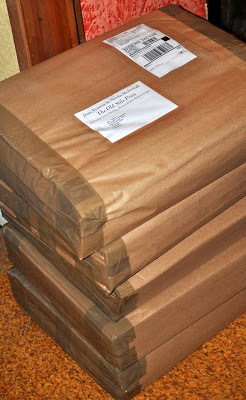 Just at the moment we have the (happy) task of sending almost all of the Special Copies of the recently published The Old Stile Press . 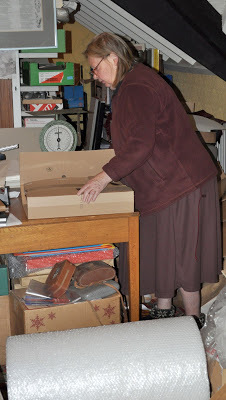 . . the next ten years to their destinations and Frances has been labouring long hours at the parcel-face! The little pile in the photo below looks all very neat and efficient but I hate to think how many hours it took to create. An ongoing standing ovation for Frances! I know just what this is like and Frances has all my sympathy as, when things are going well, I have to pack between twenty and thirty parcels a week, usually all on a Sunday night. It's one of those jobs that people only notice if it's been done badly. We should have a packers union! How splendid that two such revered followers of the blog should notice the day I receive a husbandly accolade . . . I feel like Dame Judi Dench on being voted the best actress ever! !